Ordered this suit for my wedding and could not be happier! I was a bit nervous as so many friends and family had shaken their heads and told me they thought ordering a suit online, unseen from the other side of the world was a bad idea. I admit I had reservations, but (thankfully) Iâ€™m delighted to say it is fantastic! I did put in a slightly wrong measurement for the sleeves but that was very quickly picked up on my the wonderful Joachim Petersen and quickly correct. Although the turn around time was very quick, it was also felt like the longest wait Iâ€™ve ever had for something the post. The suit itself is very well made and fitted beautifully. 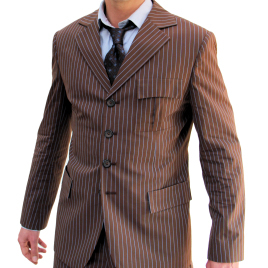 I will definitely be getting myself the coat to go with the suit before the end of the year. Itâ€™s not cheap, but having looked at some other options I can honestly say I have no regrets about my purchase at all. Allons-y!